When four young men took their seats at a lunch counter more than 50 years ago, they had no intentions of leaving and no idea what would happen. Such a simple act, denied them for so long, reignited the civil rights movement throughout the South. Today, the lunch counter and the seats are preserved at the same South Elm Street location in Greensboro as part of the International Civil Rights Center and Museum, giving all of us the chance to experience North Carolina’s place in the movement toward equality. Editor’s note: This story originally appeared in the February 2011 issue of Our State. On his way to change the world, Franklin McCain bought a tube of toothpaste. He also needed paper and colored pencils for his homework that night. His three friends made similar purchases, nothing totaling more than a dollar, and they all asked for receipts. It was around 4 p.m. when the four young men arrived at the five-and-dime, wearing collared shirts, hats, and long coats. It was winter, the first of February. After making the small purchases, they turned toward the store’s lunch counter, a long surface with a cash register and swivel stools. They couldn’t find four seats together, so they split up, two on one end, two on the other. McCain sat next to Joseph McNeil. McCain asked for pie; McNeil, coffee. The waitress strode over and looked at the young men. “We can’t serve you,” she said. They kept sitting, McCain and McNeil on one side of the counter, David Richmond and Ezell Blair Jr. on the other, four quiet and sharp-dressed college students, the first black people ever to take stools at F.W. Woolworth Company’s Greensboro lunch counter and not leave. They had been planning this for months. They were not going to move; they knew that much. What they didn’t know, though, was how the world would move around them. In the same building where the men once sat, Amelia Parker and I are headed upstairs, still coping with what we just saw downstairs: photos of lynchings and burnings and beatings, and lots of darkness. It’s getting brighter the higher we go. Parker stops talking. The only sound is of the escalator steps methodically thumping as they reach the top. The room comes into view at eye level first, and a few thumps later we’re there, at the lunch counter. Fifty-one years later, it looks almost like it did the day the Greensboro Four sat down and refused to move. The cash register is encased. The turquoise and peach stools are roped off. This is the center point of the International Civil Rights Center and Museum in downtown Greensboro. Since the museum opened last year at the same South Elm Street location as the old Woolworth’s, thousands of people have taken this escalator trip. Some cry at the top. Some claim they were there, that they took part in the actual sit-in movement. Some are white people who remember feeling one way toward blacks before February 1, 1960, and feeling another way after February 1, 1960. One even claimed that his grandmother was the old white woman who tapped the young men on their shoulders and said she was proud of them. There’s no reason to check their stories for fact. Whether they were there or related to somebody who was there doesn’t really matter. The lunch counter is a part of us all. Parker, my tour guide, is one of the museum directors. But before that, she worked in the White House for President Jimmy Carter, became the first black woman to sit on the administrative council for the International Telecommunications Union, and was the director of the Congressional Black Caucus. She was 12 years old in 1960, a time when a black woman’s success had a ceiling, and it was somewhere far short of the White House. She became an incredible woman with an incredible life story. 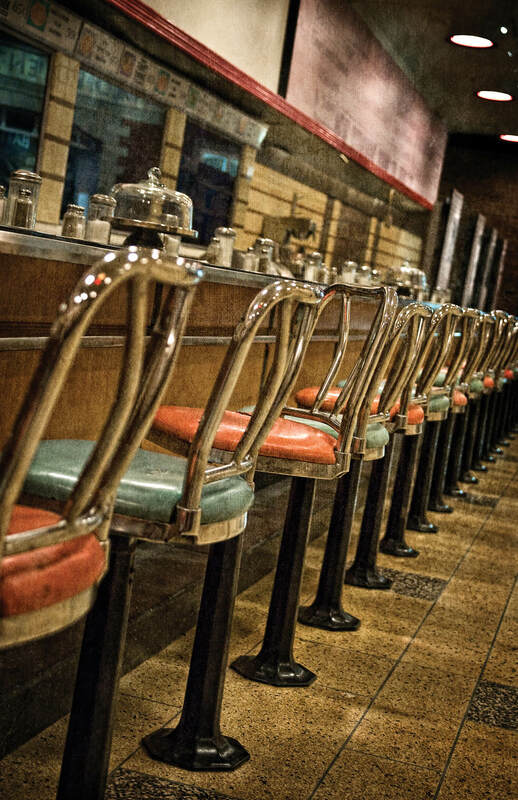 But standing with her at the lunch counter, it’s hard not to wonder how things would have played out if not for what happened in these stools. Joseph McNeil and Franklin McCain are sitting together again. They’re on a couch in the lobby of the Sheraton at Four Seasons, one of the nicer hotels in Greensboro. They just finished a speaking engagement, and they’re wearing suits, with ties still perfectly in place. McCain is taller and still has thick-rimmed glasses and poring, determined eyes. McNeil is shorter and softer spoken, and he shows a confident, knowing smile when he makes a point. McCain has a professor’s voice, broken and high-pitched when he gets excited. McNeil has a more measured tone but sometimes backs into old military speak and trails his sentences with soft curse words. Today on the couch, McNeil is on McCain’s right. At the lunch counter, McNeil was on the left. The Greensboro Four are down to three now. Richmond died of lung cancer in 1990. And Blair, who changed his name to Jibreel Khazan when he became part of the New England Islamic Center in 1968, lives in Massachusetts. The two here at the Sheraton are friendly men, open about their lives. McNeil, 68, served 20 years in the United States Air Force and moved all over the world, never offering to any of his service mates that he was a leader of the sit-ins unless they asked. His wife is a descendant of Chief Sitting Bull, the Sioux warrior who died as a result of the Ghost Dance movement. McCain, 69, is still a presence, having spent a career working as a chemist and later a leader in education. His wife is a former elementary school principal, and she sits close by. When they talk, several people stop and look at them curiously. One woman even takes a chair nearby and holds a newspaper in her lap, her ears listening and her eyes darting between the paper and these two men sitting here. Parker and I are headed downstairs, into the darkness, to start the museum tour. It’s 2 p.m. on a Tuesday, the middle of the business day. Elm Street is busy, but the museum is quiet. The whole place is made of motion sensors, so exhibits begin to come to life when someone enters a room. As the last escalator step ticks out, an electronic wall appears, reading: “We hold these truths to be self-evident that All Men Are Created Equal.” The image then fades, and the wall becomes three-dimensional, revealing a backdrop of shackles. To the right, a video pops up. To the right of that, a Ku Klux Klan robe in a case. To the right of that, a door that opens automatically into the “Hall of Shame.” Parker talks in her poetic manner, but it’s hard to listen. It’s a visual overload, the hell they put on these walls. Pictures on pieces of glass that are intentionally broken into sections to show a fragmented America. An image of a black man burned. White men watching, smiling, cheering. Two black men hanging. More cheering. The 16th Street Baptist Church. Bombed. Four girls dead. Twenty-three others hurt. Emmett Till, 14 years old, beaten, eyes gouged, shot, tied with barbed wire. Thrown into a river. For whistling at a white woman. These images are not here to disgust us or depress us. They are here to remind us that racism needed to be acknowledged before it could be changed. They are here for the same reason Till’s mother asked the editors of Jet magazine to publish on its cover the photo of Till’s beaten and tortured body lying in an open casket: She wanted America to know what it had become. This was the America the Greensboro Four knew as kids. Joseph McNeil grew up on the south side of Wilmington, and he had parents who loved him and a dog who did, too. The dog would run from house to house — white owners or black owners, didn’t matter — and make friends with anyone. McNeil still remembers the dog’s name — Trigger. Franklin McCain was born in Union County, with parents who expected him to go to college. When he shoved off to North Carolina A&T State University, he says it was like going into the 13th grade. Still, his parents walked up separate staircases to the theaters because they weren’t allowed to enter through the lobby with whites. McCain didn’t have a dog, but he remembers countless stories that are his Triggers. Both young men brought with them intelligent minds and angry hearts when they enrolled at A&T in the fall of 1959. So did two other freshmen, Richmond and Blair. The four became friends, inseparable, McCain recalls. They all majored in the sciences and lived in Scott Hall. From the first day of school in September, they talked about it all. They talked about their parents and how they were symptoms of the problem, and how shameful it was that they just took it all. They talked about white people, and how shameful it was that they just took it all away. So they started to form a plan. It was a precise plan: buying something and asking for a receipt, a time of day they’d go, and a strategy for spreading the word. The morning of the sit-in, they went to class as usual. When classes finished after lunch, they gathered. And then, before making the walk up Market Street from North Carolina A&T, the Greensboro Four put things into motion. At 2 p.m. on the first of February, they called the newspaper. F.W. Woolworth’s hot dogs were incredible, if you were a young girl growing up in Charlotte. It was humiliating to order outside, but Parker’s mom wanted her child to have everything. Parker’s mom was an English professor at Johnson C. Smith University. Before that, she went to the University of Michigan in 1936, becoming one of the first black women ever to attend school there. She was born in 1902, the granddaughter of a slave. She spent her life fighting for the education of black children. She sent Parker to a private high school in Asheville when she was 12. Parker earned her college degree at Johnson C. Smith, and she was on campus the day Martin Luther King Jr. died in 1968, when riots sprang up everywhere. Parker began working for the Democratic Party as soon as she graduated. And by the end of the next decade, she was working for President Carter in the White House. Change is measured in different ways and over different periods of time. It can come over the course of three generations or it can come over the course of 90 minutes at a lunch counter. Either way, change is not merely a moment in time. Change is the reaction to the moment in time. 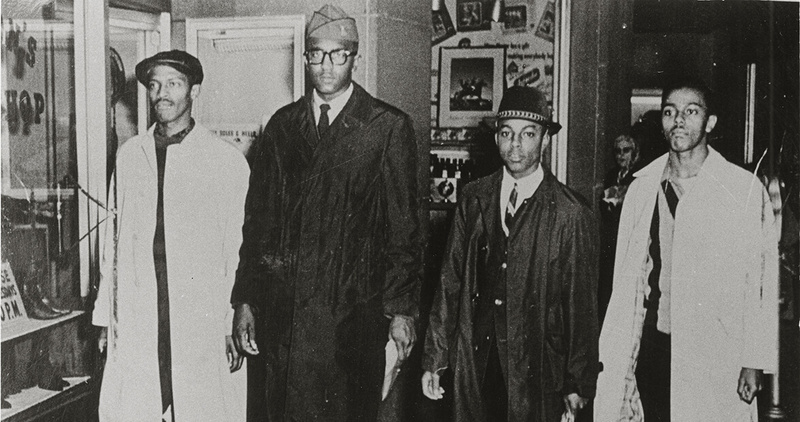 The iconic image of the Greensboro Four is a picture of them standing up. Richmond is on the left side of the photo. Next to him is McCain in the glasses, and next to McCain is Blair in the fedora, and on the right side of the photo is McNeil with his chin up. McCain and McNeil have prints of the photo framed in their homes. But it’s more than a memento. It’s vital to the story. The Greensboro Four were hardly the first college students to stage a sit-in. In fact, it happened in dozens of places around the country, but nobody noticed. The Greensboro Four wanted to be noticed. That’s why they called the newspaper. Jack Moebes, who took photographs for both the Greensboro Daily News and the Greensboro Record, was outside of Woolworth’s on February 1 at 5:30 p.m. — the store closed early that day. Moebes took the picture that made people notice. It’s fitting, in a way, that they were standing up. It was a photograph that showed the first image of the reaction to their moment in time: four young men, proud of themselves and determined to keep coming back. Parker and I are upstairs now, just beyond the lunch counter, looking at mock-ups of front pages of newspapers from around the region from February 1960. By early that year, the civil rights movement had slowed down. It needed a spark, but it needed to be a peaceful ignition. Four men sitting silently at a counter came at the perfect time. McCain, McNeil, Richmond, and Blair went back to campus that night and told the student leadership what they had done. Groups began to form, and schedules developed. On the second day, about 29 people showed up. More on the third and more on the fourth. By day six, 500 students crammed into Woolworth’s. Ku Klux Klan members stood outside and tried to intimidate them. The lunch counter became full of men and women, black and white, who didn’t fight back at the intimidation. People put cigarettes out on them and threatened worse. But they didn’t fight back. “We told everybody, ‘If you can’t tolerate being spat upon or being called ugly names, there’s something else for you to do. But don’t come downtown,’” McCain says. Four of the angriest young men on campus had been joined by others with the same fire in creating a peaceful revolution. By unclenching their fists and shutting their mouths, they fought. Five months later, on July 25, 1960, the Greensboro F.W. Woolworth Co. lunch counter was integrated. The Greensboro Four were not there to eat. Amelia Parker began my tour by insisting that I not include her in this story. A great-granddaughter of a slave and the first black woman to serve on a top United Nations committee, Parker contended that she wasn’t part of this story, that the important people were on the walls in the museum. She even called McCain and McNeil to set up my meeting with them at the Sheraton the next day, deflecting attention to the stars. One wall in the museum is covered with a photo from inside a segregated bus. Loose, leather straps hang in the back, for black riders to hold. Sturdy, white handles hang in the front, for the white riders. Nearby, there’s a double-sided Coca-Cola machine — white Coke on one side, black Coke on the other. There are “Whites Only” signs throughout the exhibits and old playbills from segregated shows. The story covers separate but unequal schools, with façades from the schools in Topeka, Kansas, and Little Rock, Arkansas. The museum contains shards of broken glass that were blown out of the 16th Street Baptist Church in Birmingham, Alabama, where four girls died in a bombing in 1963. There’s a Bible and a church organ, countered by photos of burned and bombed churches and synagogues. There’s one of the pens President Lyndon Johnson used to sign the Voting Rights Act into law in 1965. Toward the end, there’s a case that shows 1,000 mug shots of people arrested for standing up for civil rights. They’re all better stories than Parker, she insists. There are photos of hundreds of leaders from the movement on a wall, with the Greensboro Four’s mug shots just a little bigger than the rest. Some of the mug shots form an image of President Obama’s face. When we walk in, a final, short movie plays. It’s a hopeful film, the bookend to a tour that started with the “Hall of Shame.” Inside a glass case near the exit, there are photos of movements in South Africa, Tiananmen Square in China, and Kosovo. There are two pieces of the Berlin Wall — donated by Parker. A friend gave them to her when she was in Washington. They were hers, and now they’re the museum’s. Still, she insists — it’s not about her. She walks me out the door, and we stand briefly in the lobby facing South Elm Street. We are tiny figures next to the larger-than-life picture of the four young men walking out of a five-and-dime covering the wall next to us. It’s perhaps the best argument she’s made all day as to why this story about a museum isn’t about her. It’s also the best argument she’s made as to why it is. This place, this museum unlike any other, is a place about us all. Several months after the owners of F.W. Woolworth Co. integrated the Greensboro store, the four young men were invited back to eat there at a ceremony in their honor. McCain ordered eggs, hash browns, and coffee. McNeil ordered coffee and pie. They were served. We’ve been sitting here for about 90 minutes, and clearly it’s time to go. McNeil has a plane to catch home to New York, and McCain has to get home to Charlotte. These two members of the Greensboro Four will see each other again soon. There’s always another group that wants to hear them speak. “This is the only friend I’ve got,” McCain says. I don’t want them to go. This started out as just a story on a new museum. Then I went down the escalator and came back up, and now here I sit in a fancy hotel with two men who changed the world. Wanting to keep them one minute longer, I blurt out a final question. McNeil breaks into that confident, knowing smile and grabs his bag. He’s been asked this before, thousands of times. McCain’s voice cracks as he lifts from the chair. We exchange handshakes, and I thank them. They begin to nod and smile at me, and I quickly become aware that they want a private goodbye with each other. They’re not going to move until I do. So I walk away. And they stand together.